Designed by artist Jessica Sporn this menorah sports a different colored cat for each night. Paw prints 'walk' all along the base of the menorah. Material: Polyresin Size Length: 10" Depth: 3" Height: 3 1/4"
DESIGNED BY ARTIST JESSICA SPORN! Beautifully designed menorah by famed artist Jessica Sporn. 3.75 INCH HEIGHT! Celebrate the lighting of Chanukah candles with a modern-design Menorah. It will enhance your Holiday for years to come. ATTENTION CAT LOVERS! 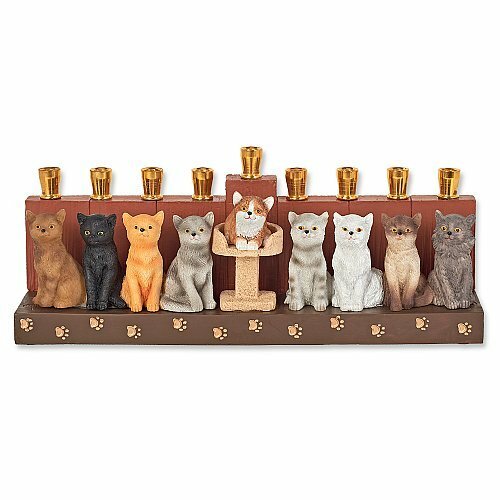 This menorah sports a different colored cat for each night. Paw prints 'walk' all along the base of the menorah. If you have any questions about this product by Jessica Sporn, contact us by completing and submitting the form below. If you are looking for a specif part number, please include it with your message.